Shri Ambika Niketan Temple Surat is the famous temple of Hindu Goddess Maa Durga. It is popularly known as Ambe Ji, Ambe Maa temple and Ambaji Mandir in Surat. Ambika is the name of the Goddess Shakti or Adi Sakti. Goddess Ambika has eight arms which hold multiple things and weapons. You can see the very beautiful statue of Maa Ambika in the temple. 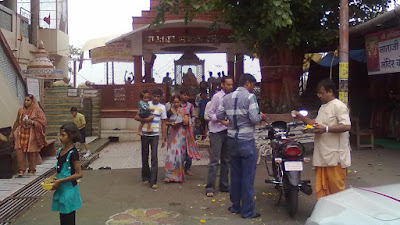 Shri Ambika Niketan Mandir is situated at the banks of Tapti River. You can see also the Tapti River from the temple of Ambe Ji. During the Navratri, Ambe Ji Mandir is very crowded and a long queue to the darshan of Maa Ambika. Surat's local people come to Ambaji temple when they purchase new vehicles such as bike, scooty, car etc and want to get blessed with Maa Ambika blessing with him. Temple is neat & cleaned and well maintained. Shri Ambika Niketan Mandir Surat is almost 50 years old and was built by the Maa Ambika's devotee Late Smt Bharti Maiya. You can see the statue of Smt Bharti Maiya in the ground floor of the temple. Ambika Niketan Temple is two storey building. At the first floor, you can see the statue of Goddess Ambika and other Gods statue such as Lord Shiva, Laxmi Narayan etc. Best time to visit Shri Ambika Niketan Mandir Surat is during the Navratri in October or November. You can also go there in February or March. During the rainy and summer season temple is less crowded. As per my opinion for any temple, the best time to go there is morning time. But you can go Ambika Niketan Mandir in the evening time also during 04:00 pm to 06:00 pm. 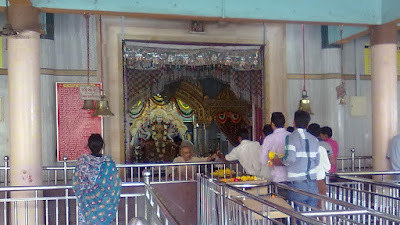 Shri Ambika Niketan Temple opens daily in the morning at 6.00 am to 12.00 pm, and in the afternoon for 12.00 pm to 3.00pm closed and again opens at 3.00pm to 08:00 pm. So you can go there any day. During Hindu festivals, temple opening and closing timing little bit changed as per requirement. Two and four wheeler parking facility is there. 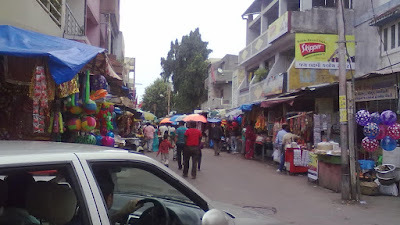 There are various types of shops including sweets and Prasad shops. Fooding and lodging facility at cheap rates also available for devotees. Shri Ambika Niketan temple is run and maintained by the Shri Ambika Niketan Trust. Shri Ambika Niketan Trust also runs an old age home for old peoples. It is a charitable trust. Surat is a very famous city of the Surat so reaching to Surat is very convenient from anyway. You can go by Bus, train or by Air. The railway is the most preferred way of transport for the nearby cities peoples to reach Surat. The frequency of trains between the Mumbai to Surat is very good. 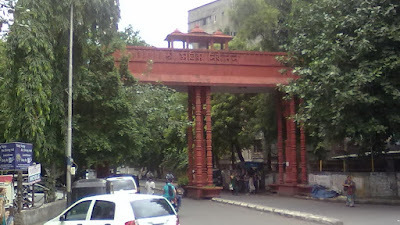 Shri Ambika Niketan Temple is situated in the main Surat at Dumas road near Parle Point and very popular among the local people. So reaching the temple is not a big task. Distance from Surat center to Ambaji temple is only approximately 7 km. Ambeji temple is 8 km from the Surat railway station. You can get easily the city bus, Vikram or Auto for Ambika Niketan Temple. They will drop you at the entry gate of the temple. 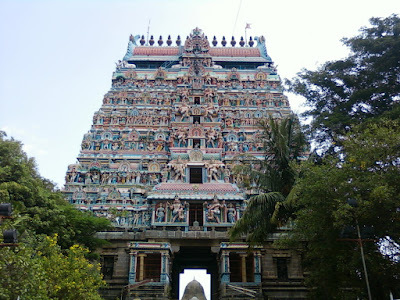 The main temple is approximately half km far away from the entry gate of the temple. If you ask as Shri Ambika Niketan temple then maybe anyone not tells you the temple address but if you asked as Ambaji Mandir or Ambaji temple then you definitely get the exact address by anyone. For more convenience, I mention the address of the temple here. On Sunday the temple is crowded so if you don't like the crowd you can avoid going on Sunday. At Shri Ambika Niketan Mandir parking facility is there but the capacity is low. So during any Hindu festival or Navratri parking of two or four wheelers is difficult in the temple parking area. You can also visit the Shree Swaminarayan Gurukul in Surat. It is also a nice place to visit once if you are in Surat.